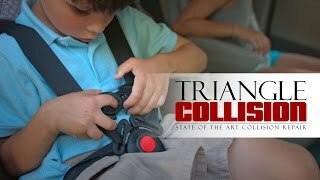 Triangle Collision is a Toyota body shop serving Morrisville and Cary, NC. We provide trustworthy repairs and never cut corners when it comes to our customer’s safety. Drivers turn to us when they need honest and hassle free service after a collision. We know how to handle your insurance claim and return your Toyota to pre-accident condition. If you live in the Morrisville or Cary area and have a Toyota that was involved in an accident, contact Triangle Collision at (919) 460-7693 or click here to contact us online! We stand behind our collision repair with Lifetime Warranties for many of our services. By following strict factory guidelines we promise to return your Toyota to pre-accident condition. We believe in quality over quantity service, and never cut corners in our repairs. The quality of our service helps us to develop long lasting relationships with our customers. After a collision, it is important to know that you have a Toyota repair shop that you can trust. We understand the specific needs of modern vehicles. There is no one-size-fits-all repair that can maintain the integrity of your Toyota’s performance and safety features. We follow the process recommended by the factory when repairing your vehicle so that all of its systems continue to work as intended. We make the repair process as stress free as possible. From convenient services such as 24/7 towing, to onsite paint and refinishing services, you can depend on us. It’s your choice, not the insurance companies, where your vehicle is repaired. Choose Triangle Collision, the Cary, NC area’s premiere Toyota Body Shop & Collision Center. Many Toyota repair shops do not have the same dedication to quality repair as Triangle Collision. In order to service as many vehicles as possible, other repair shops will cut corners. This leads to incomplete repairs, or ignored damages. Triangle Collision will never simply cover up damage. We complete a full vehicle inspection no matter how severe the collision damage appears on the outside. Even if the external damage seems minor, there could be frame damage beneath the surface. These sort of damages can lead to more severe problems in the future. Triangle Collision repairs are done the right way. We maintain the value of your Toyota by returning it to showroom specifications. We understand the intricate craftsmanship of modern Toyota vehicles and will follow the proper step-by-step process to repair each and every component. The safety of your vehicle is not something to rush through. In order for safety features to function as intended they need the vehicle to be repaired to factory specifications. Toyota has invested heavily into crafting safer cars, we intend to keep them that way. In the event of a collision you should never attempt to drive your vehicle if you are unsure of the damages. Triangle Collision has partnered with Lemon’s Wrecker Service so our customers can have access to their 24/7 towing and hauling service. They bill us directly for your towing job so that we can wrap the repair and transport into one convenient price. This way it can all fall under the coverage of your insurance claim. We have a lot of experience with collision repair claims. Insurance companies will sometimes try to avoid covering the cost for a proper repair. We know how to get your vehicle back to pre-accident condition.